Last month, I asked you to help me organize my baseball cards by making trades that let me clear out some of my unneeded ones. Gary sent me a pair of autographed cards in exchange for a stack of Oakland Athletics. Gene Clines spent 10 years in the major leagues, but his playing career was before my time. He is probably best remembered for his time in Pittsburgh, where he won a World Series ring in 1971. 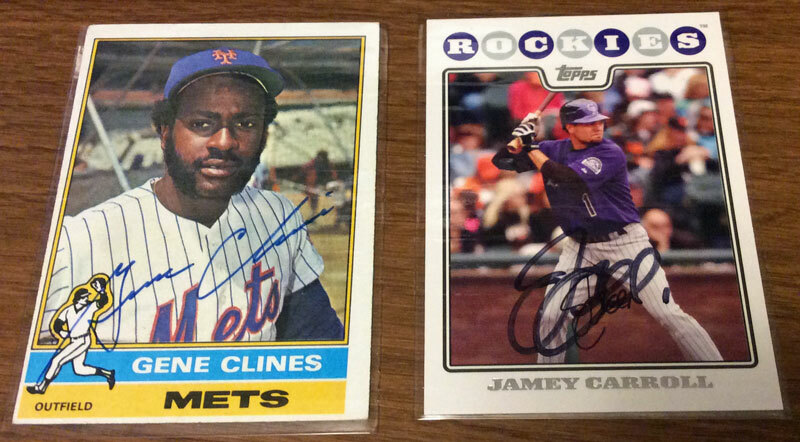 Clines also played for the Cubs and Texas Rangers in addition to the Mets. In 1979, Clines retired as a player and immediately became the Cubs’ first base coach. He’s remained in baseball since then, taking coaching jobs and front office positions with the Astros, Mariners, Brewers, Giants and Dodgers. Jamey Carroll spent parts of 14 seasons in the major leagues despite not making his major league debut until the age of 28. Carroll started at second base in the Montreal Expos’ last game in 2004 and was part of the original Washington Nationals team in 2005. He also played for the Colorado Rockies, Cleveland, the Los Angeles Dodgers, the Minnesota Twins and the Kansas City Royals. Carroll went to spring training with the Nationals this year, but did not make the team.